As the end of the school year starts to wrap up, I’ve been thinking more about how excited I am about summer break, but also the ways that I would like to change my room to make next year even more efficient than this past year. One of the areas that could use quite a bit of revamping is my classroom library. Last year and this year I used Beth Newingham’s genre labels to organize my classroom library. However, last year I taught fourth grade and genre labels were more appropriate. This year I taught second grade and well, let’s just say that genre labels are nice but we need something that is a bit more practical and something that will keep my hair from producing any more stray grays…at the lovely age of below 25. 2. Students were shuffling through genre baskets and couldn’t find the right level. 3. Students were wasting reading time searching through baskets to find books on their level. 4. Genre baskets were getting mixed together, despite the attempt at organization and clear labeling at the beginning of the year. Hoping to keep my kids in tune with the genres that they are choosing, I am planning to keep my current sticker system, which gives each book a sticker color on the corner of the cover that corresponds with the genre label. The sticker also has the Guided Reading level written on it to guide students towards choosing a “just right book.” But, I would like to organize my books by their reading level, instead of their genre. Needing everything to be bright and cute, I used Microsoft Publisher to create some cute labels that I would be ecstatic to display anywhere in our rom. 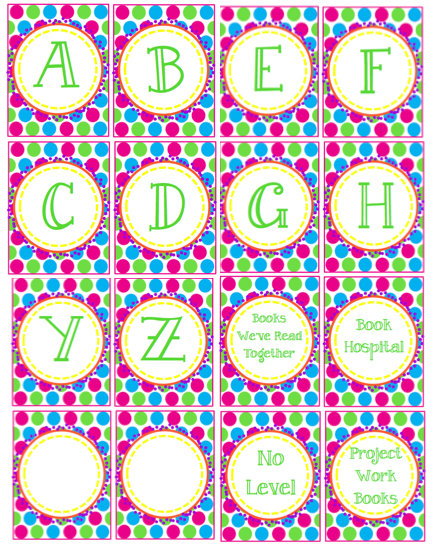 You can get a free download of these labels at Teacher's Pay Teachers. I am also planning to stick an insert into each child’s reading folder in the fall with a genre sticker correlation chart. I will attempt to post that on here, as well, once I have it made!